Before you start wash your hands with soap (preferably non-perfumed, anti-bacterial liquid soap), then rinse and dry your hands with a lint-free towel. Check that the lens isn't inside out. To do this, just put the lens on the tip of your finger and hold it up to the light. If the edges flare out, it's inside out. Some lenses have a 1, 2, 3 indicator—make sure the digits aren’t backwards. It should look like a bowl with straight edges. Using your right hand, gently hold your upper eyelid with one finger so you don’t blink or get your eyelashes in the way, and carefully pull down your lower eyelid with your other fingers. Move the contact lens toward your eye steadily. Look upward as you place it on your eye, and slowly release your eyelid and close your eye for a moment to allow the lens to settle. Repeat for your other eye. Watch this video for a quick tutorial on putting your contacts lenses in your eye. Ensure your hands are clean and dry, and start with your right eye, then look up and carefully pull down your lower eyelid with your middle finger. Bring your index finger to your eye slowly until you touch the lower edge of the lens, and slide the lens down to the lower white part of your eye. Gently squeeze the lens between your thumb and index finger and remove it. Repeat for your left lens. Discard daily disposable contact lenses. If you wear dailies you can toss them out, but make sure you clean and disinfect bi-weekly and monthly contact lenses. 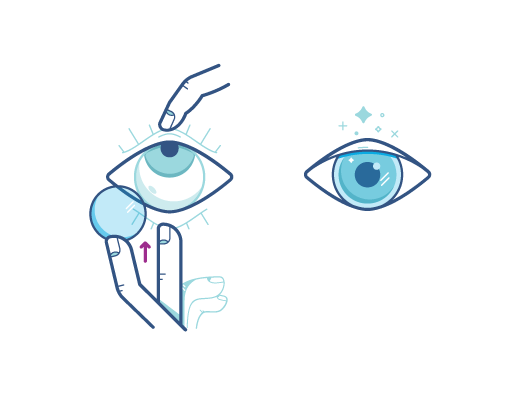 Watch this video for a quick tutorial on taking out contact lenses.